Devotion...tragedy...unrequited love...youthful innocence and mature longing...all the ingredients are here. The narration is tight and the acting is on point. Too bad some heavy gut punches happen off-camera, such as the son dying or Fontaine dying. Fav scene: seeing Stefan again after his decline and the watcher realizing he still doesn't recognize her before she realizes it later at his house. Despite having a near-Shakespearian level of tragedy, it's also one of the warmest and dreamiest films I've ever seen, with a 19th century Vienna that feels like a fairy tale I want to get lost in. One of the most European-feeling Classic Hollywood films, it's also unusually deep and thoughtful in its exploration of love and fate, with a wonderfully varied and nuanced performance by Joan Fontaine. Irritating due to how great this should have been if not for a few baffling plot points. Nov 24, 2018 Iulius E. S.
Joan Fontaine narrates in the opening: "I think everyone has two birthdays, the day of his physical birth and the beginning of his conscious life," which she intends and the viewer takes as the day a person falls in love. The platitude comes to a more resounding fruition when this ostensibly naive and weepy melodrama arrives at a late point of hard-earned clarity, rephrasing its earlier insinuations about fate, and subverting our trope-based expectations, into a sadder and tougher denouement. 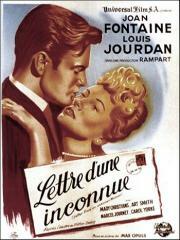 Golden Age Hollywood romance doesn't get much better than Letter From an Unknown Woman, a powerful tale of doomed love. not unenjoyable, but this is a fundamentally silly story about a young women with a pathetic infatuation for some pianist dude. the sort of thing i can't possibly take seriously. This film travels too far down the path of romanticizing thoroughly unreciprocated love, but the exaggeration that it deploys to service its gluttonous narrative is unexpectedly compelling, and the thin characters are awkwardly joined in such a way that the end result, while misshapen, runs full circle to take on the desperate edge of real desire, the empty, one-sided pursuit of a person for reasons both indescribable and unavoidable. Despite some irritating irrationalities and holes in the plot, it worked as a romantic drama reasonably well. Performances were good and stylistically its execution was on point. Didn't love the first half of the film, but the second half was well worth the wait. There are few characters in film history who so thoroughly exemplify the thrust of melodrama. This film, consequently, appears to stem its genre less from formula than from Lisa's actual core, hazarded, not unlike that of the unfortunate leading ladies of opera, on curtains that rise and fall, until they don't rise anymore. A very earnest and well done bit of melodramatic nonsense that must have been en vogue at the turn of the century. Still, what an extraordinary beautiful and elegant picture it is - you might get lost in the romance of the images alone.